svelte 10kg. With Trafomatic co-owner Milorad ‘Mica’ Despotovic in charge of ﬁnishing, custom paints or even woods are always just one ask away. Over the years, this Serbian valve gear house has made a name for itself with many quite exotic custom commissions. Some of those pushed circuit designer and chief engineer Sasa Cokic deep into new terrain. This subsequently trickled down into regular production items. It’s how wealthier clients can double as patron saints for the type of hiﬁ which the rest of us can reach for. Trafomatic’s oﬃce system. Quad cartridge custom Collins phono stage on top of Trafomatic’s new production rack. be a balanced but single-ended circuit with transformer-generated XLR like our Nagra. Either approach is fully optimized for just one format. The back panel shows the comprehensive socketry including a ground post, phase toggles, a ground lift and the 8-pin power input. The externally accessible 115/230V switch of the PSU unit makes for convenient power conversion and one global model. triode’s halves become vital factors. Lara’s clean/dirty- box architecture exploits another trick. It segregates the noise-sensitive signal path from the grimier power supply magnetics. The dirty laundry goes into the lower box, the neatly folded starched lot ends up in the upper box. A short umbilical connects the two. Those in need of even more socketry have the Reference One model. Aqua Hiﬁ Formula DAC’s balanced output and the fully balanced LinnenberG Allegro mono ampliﬁers? A black Lara on the assembly bench, one of the two chokes prior to potting in the insert. By way of preview, at the Munich HighEnd 2017 show, Trafomatic had collaborated with Audiobyte, Rockna, Skogrand Cables and Tune Audio. Sasa’s amp contributions there were obviously his oﬃce system Elysium monos. Having heard this room at previous shows with Engström and ModWright electronics, this year’s showing with the big Avaton was my favourite yet especially after the system had settled in over two days. The Lara preamp held down the preamp fort, showing herself in quite elite company. Delivered in a stout chip-board crate with metal handles and inner cardboard box followed by thick foam liners and protective cloth covers, the review loaner emerged in immaculate matte black paint. The red detailing on the remote control was the only concession to orange being the new black. A very recent minor cosmetic redesign of the control knobs meant that mine didn’t yet sport the hair-line scale of the white unit at left. Since that’s the ﬁnal look, we’ll go with the stock image. Once opened, ground wire connection between metal liner and bottom removed, the head unit’s small input transformers and four-gang attenuator proved to be hidden beneath the inverted circuit board at the front. The potted massive chokes hid expectedly inside their canisters, with their in- and outgoing brown cables tightly twisted. Mounted horizontal in military fashion, the tubes were attached to a solid metal brace whose back, via standoﬀs, hosted their matching circuit board. With the main signal cabling thickly insulated, lady Lara’s undercoat was just as ﬁnely made as her outer garments. It’s reasonably rare to ﬁnd hiﬁ components clad in a wooden chassis which here get fully lined in metal to conform with international radiation standards. The four footers turned out to be solid metal cylinders ﬁnished oﬀ with thick black felt pads to protect the paint of the PSU beneath it since the short included umbilical mandates such a stacked placement. The power supply duplicated the same hybrid wood/metal construction… with more chokes and sundry voltage regulators. As the name Trafomatic suggested in the ﬁrst place, their balanced preamp would sport plenty of iron to get the job done. That’s a very diﬀerent approach from typical modern solid-state preamps.Here we see how the second RCA line-outs are labeled ‘sub’ but they could just as well be used for bi-amping with two stereo ampliﬁers; or to feed a separate headphone amp. reminder of ‘on’ was a small red LED below the side-mounted power switch for tastefully subdued operation. After the preceding review of the two-stage tube-powered HQ9038 DAC from Vietnam which splendidly interfaced with our nCore 500-based class D monos, that’s the ﬁrst ampliﬁcation Lara played to. With stout volumes attained below 7:00 on the dial and increasing rapidly from there to never make it to anywhere near 8:00, I had to ask Sasa about his circuit’s gain. Either that was unexpectedly high; or the attenuator’s taper very steep. After all, very few amps sport as low an input sensitivity as his 3.5Vrms Elysium monos. “Gain is just 20dB. Probably your source voltage is too high.” That certainly was a possible answer. Another would be that a balanced preamp should be tailored to modern balanced sources, most of which output twice on XLR what they do on RCA to mean 4V if not more. Combine that with amps of 0.5-1V input sensitivities and a well-judged volume taper ought to allow one to gradually hit 10:00 before things blow up. All of this would be so much easier if core hiﬁ specs were standardized. But they aren’t. Now impedance and gain mismatches are very common. In our case, the balanced sources rate at 16V (COS Engineering), 6V (hq audio), 4.6V (Fore Audio), 4V (Auralic) and 3.8V (Aqua Hiﬁ) whilst our balanced amps deliver full power at 0.7V (Pass), 1.5V (LinnenbergG) and 2.5V (Nord), all with roughly 26dB of voltage gain. In such scenarios, nobody needs a preamp for gain, just for source switching and volume. That a preamp can still sound better than a source-direct connection is one of hiﬁ’s mysteries. take class D’s massive negative feedback in stride without drying out. Yet on our Audio Physic 4-ways, the same combo gets too lean and pedantic. However; when I’d replaced our usual Aqua discrete R2R DAC with hq audio’s HQ9038—2x12AU7 I/V stage, 2×6922 balanced outputs—the powerful valve signature of the Vietnamese/Danish DAC had prompted a course correction from too cool to straight down the middle. This expertly avoided any thick or fuzzy tube-dominant outcome. Given that happy precedent, I expected that back to our Aqua converter, injecting tubular action into the preamp stage instead should net a similarly happy nCore/ Codex marriage of amp to 89dB speaker. And so it was. Despite hitting desired levels at 7:00 where clients with similar conditions would surely specify attenuators with a far shallower taper, I had neither channel imbalance nor sonic signs of a mismatch. This included noise; or rather, the blessed absence thereof. Without signal but ear on tweeter, the ﬁrst onset of subliminal power-supply hum occurred at ~2:00 which even at full tilt remained very minor. Considering the wildly excessive gain of my ﬁrst chain, this suggested excellent circuit design. Unlike the late Terry Cain who happily tolerated how his favourite best- sounding tube amps all hummed into his hi-eﬀ widebanders, I ﬁnd noise unacceptable. Whether mechanically buzzing transformers or electrical power-supply surf, noise is the enemy of ﬁne detail. As such it should have no place in costly high-end hiﬁ. At the volume settings I actually used and well beyond them, Lara was dead quiet. With her one need make no excuses for listening to last-century tube tech. with true balanced circuitry since the majority of audiophile class D amps run balanced input buﬀers. The functional advantage of such a combo is far higher power delivery than most all class A or AB amps can muster for the same coin. The sonic advantage is something closer to class A fullness than pure class D tends to. Finally, today’s best class D oﬀers 120dB or higher signal-to-noise ratios which might maximize whatever resolution advantages so-called hi- res ﬁles promise. The hybrid path of tubes+classD is thus an attractive solution to marrying retro with current tech. From my two recent experiments along those lines, I would highlight in particular excellent low-level listening clarity. Pretty much all competent hiﬁ sounds impressive played loud enough as long as room and ears don’t protest. At low levels meanwhile—the sort courtesy demands at 6:00 AM or 23:00 hours whilst neighbours or loved ones still or already sleep—most hiﬁ systems are stuck in ‘park’. The simple proof is our irresistible urge to grip the remote and prime the pump. True resolution with sonic fullness eliminates that twitch at the root. When everything is panoramically laid out in perfect visibility and full colour, at levels one could talk over, wanting or needing to listen louder just doesn’t present itself. We’re already satisﬁed. Traditionally this early- riser quality belonged to exotic 100dB widebanders and large horns. Whilst true, they just don’t own it exclusively. Even normal 89dB boxes can do it if the preceding hardware allows for it. The Lara+nCore combo most certainly did. In my book that’s a core requirement for enjoying music under typical domestic constraints, i.e. outside a few allowable hours not in the hermetically sealed basemencave or separate barn but regular leaky living room. regular speakers are a very valid approach. The tubes handle the warmer sunnier climate with its riper t o n e f r u i t , t h e switching transistors are the masters of control and resolution. It’s certainly not the only option to arrive but relative to the ampliﬁer side, likely to be the most cost- eﬀective. PureMusic’s 64-bit software ﬁlter to 10dB down. ideally of course Trafomatic would revisit that aspect. bandwidth which most expresses virility and punch to perhaps be called the centre of grooviness when rhythmically taut tunes really lock in to swagger. Here Sasa’s circuit execution expressed a very vital deeply tanned personality even on simpler tunes. Far from dark, this presentation simply looked at things from the bottom up. It felt very grounded and gravitationally weighty not ﬂoating. Separation was typical 3rd-order dominant THD, i.e. not feathered or blurry but with ﬁrm edging. The predominant eﬀect of this grouping of qualities was intensity. Lady Lara played it intense. probably reﬂected a balanced circuit’s cancellation of 2nd-order THD, hence not even subtly cloying SETishness. Adding it up. Sometimes not much needs saying or parsing. When something sounds this attractively right and plain works, repeating examples for why and how just gets annoyingly repetitive. Lara was clearly a tuber by how she tonally made the tunes pregnant and weighty. Yet coiled dynamics, controlled bass power and clean image outlines countered any sepia vintage notions. This played it feistily modern, hence perfectly adapted to bass-heavy rhythmically agitated music from the 21st century. 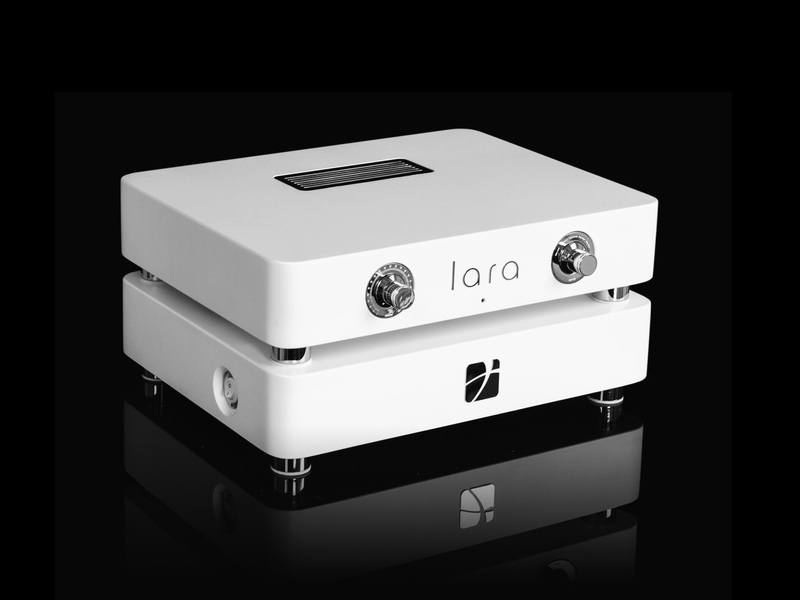 Big tone, generous voltage swings, muscular power-region presence yet simultaneously clean, sorted and sober… whatever you call that constellation of attributes, it was the Lara preamp from Mladenovac. Running tubes fully balanced perhaps does exorcize them of certain behaviours which dedicated transistor lovers might otherwise ﬁnd fault with? This double-decker proposition certainly suggested exactly that. A very ﬁne showing that should appeal also to career solid-statesmen and women; and works like a charm for switching transistors.